In March I received a carefully thought-out proposal for a resource center that would support students who feel themselves to be at risk because of their own experience on campus or who feel marginalized by long-term trends in our country. This proposal was an outcome of campus discussions and protests affiliated with the Black Lives Matter movement. Next year, I’m pleased to say, the Resource Center will be a reality. 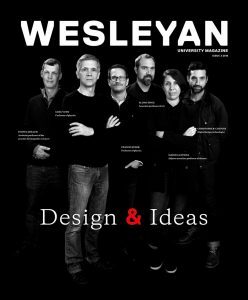 This issue of Wesleyan magazine focuses on important dimensions of past equity and inclusion work at Wesleyan. Such work remains as important as ever on our campus and in our country. While Wesleyan feels at times like an island, it most decidedly is not. As I write this, there are numerous reports in the press of hate crimes and public acts of discrimination and harassment directed at minorities and women. The pain of targeted groups is real because the threats are real, and we must acknowledge those threats and work to mitigate their effects. We must fight to protect Jews, Latinos, and Muslim Americans from violence driven by socially sanctioned scapegoating and bullying. We must ensure that our friends in LGBTQ communities are not marginalized by the newly empowered narrow-mindedness attempting to take control of our legal system. We must be vigilant with respect to racial disparities in the practices of law enforcement—often so devastating to African Americans in particular. At Wesleyan, we must not waver in striving to build inclusive communities that reject white supremacy, bigotry and fear; we must not waver in expressing our care for one another in a context of fairness. As I’ve said before, that context of fairness must also include ensuring that there is a place for conservative points of view on campus. We must be willing to engage with ideas that challenge the progressive higher education consensus—ideas that many of us find all too easy to take for granted. That does not mean that we should discover patience for bigotry, but it does mean that we should seek to understand alternative conceptions of justice, freedom, and community that conservative and religious traditions today have to oer. Only through attempts to understand the logic of the other’s viewpoint (as a student recently put it) can the reasonable negotiation on which democracy depends take place. Whatever one’s politics and whatever the trajectory of events, it is vital that we remain committed to the work of improving our public lives. I make no claims to know the direction of history’s arc (or even if it has one), but of this I’m certain: We must not abandon the public sphere to those who would return to a past in which people of color, women, and queer folk were even more systematically excluded from access to basic rights. As engaged participants in a polity dedicated to liberty and justice for all, we must defend those who are disenfranchised and made more vulnerable. And as educators, we must help students better understand how they can be effective in the public sphere beyond the stage offered by campus politics. There is work to be done in neighborhoods, towns, cities, state capitals, and in Washington. With both major political parties rethinking their approaches, there’s no better time to be engaged. This is not the time to hunker down with those whose opinions one shares. We need more conversation across political and cultural differences; we need new modes of engagement that take us beyond our echo chambers of ideas and curated news feeds—and in these regards I am encouraged by recent student efforts to hold discussion sessions that attract Republicans, Democrats, Socialists, and Independents. Cynicism and irony are too easy a response to political disappointment. Regardless of political affiliation, we can work together—on campus and beyond the university—to solve specific problems and create real opportunities for more individuals and groups. And here at Wesleyan, we will continue to create opportunities for all members of our community to be challenged, to be at home, and to thrive.